This is how F-22 fighter pilots train to improve their air-to-air skills. 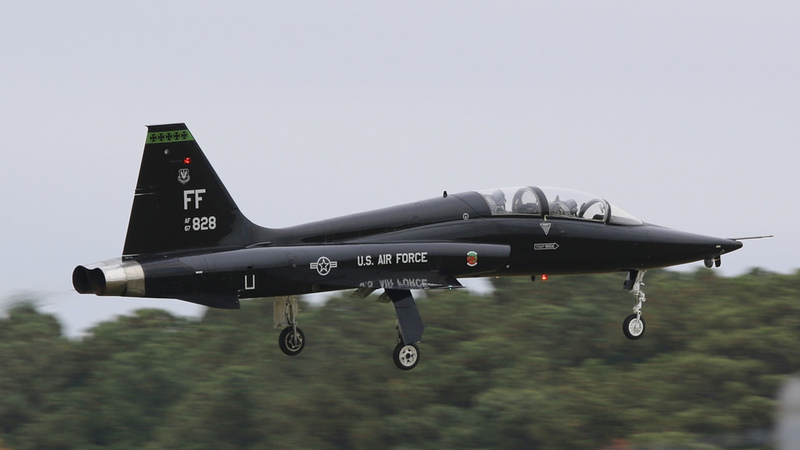 The venerable T-38 Talon which first flew in 1959 (production ceased in 1972) has found new life as an adversary aircraft used to hone the skills of Raptor pilots. The aircraft, pulled from storage at Davis-Monthan Air Force Base and refurbished with current systems (including jamming pods such as the AN/ALQ-188) have been deployed in support squadrons at Holloman AFB, Tyndall AFB and Langley AFB (Joint Base Langley–Eustis). The T-38s provide an excellent simulation of a number of non-stealthy adversaries that Raptors could come into contact with from countries around the globe. Beyond their value as adversaries, the Talon’s cost per flight hour is reported as $18,000 less than the Raptor and they preserve precious flight hours on the F-22s. Small, relatively fast, and painted black the Talons are difficult to put eyes on, though primary training would imply detection and “shoot down” BVR (Beyond Visual Range). The T-38s are typically flown by Raptor pilots who are the most qualified to challenge the Raptor, and exploit any and all perceived air-to-air vulnerabilities. Imagine a widely dispersed flight of T-38s moving fast at 50 ft off the water attempting to penetrate an area under Raptor CAP (Combat Air Patrol). The final result most certainly makes Raptor pilots extremely familiar and confident in their aircraft and its capabilities as they push both sides of an engagement thoroughly. A typical day at Langley features the launching of groups of Raptors (1st Fighter Wing) and Talon adversaries (27th Fighter Squadron) morning and afternoon on two hour sorties for Tactical Intercepts and Offensive/Defensive Counter-Air training. The training realized in these daily encounters ensure mission ready, mission capable pilots are available for deployment to any number of global hotspots. Perhaps most significantly this training provides an unparalleled level of confidence for Raptor pilots, for it is one thing to believe you are invisible, and another to know you are. It is this kind of confidence that leads to engagements like that of the F-22 Raptors sliding up undetected and unexpected on IRIAF (Islamic Republic of Iran Air Force) F-4 Phantom jets that were attempting to intercept a U.S. MQ-1 drone flying in international airspace off Iran. Leaving no doubt, Raptors with Talons are more dangerous than Raptors alone. Special thanks to the PAO of Joint Base Langley–Eustis. Todd Miller lives in MD, US where he is an Executive at a Sustainable Cement Technology Company in the USA. When not working, Todd is an avid photographer of military aircraft and content contributor.